Cagnes-sur-Mer is a picturesque commune between Nice and Cannes in the Departement of Alpes-Maritimes in the Provence-Alpes-Côte d’Azur region of south-eastern France. It is part of the metropolitan area of Nice Côte d’Azur (Urban Community of Nice Côte d’Azur) and the largest suburb of the city of Nice, being located approximately 15 km to the northwest of the city centre. Cagnes-sur-Mer possesses a large plot of land within the low-rise city centre. This is located close to the motorway, where the project is to be financed partly by public funds (both regional and local) and partly by private investors. The project was initiated and supported by the Mayor of Cagnes-sur-Mer, the Honourable Senator Mr Louis Negre. The commune is planning the construction of a new town hall, as well as sizeable areas to be used for residential and communal purposes and a large, publicly accessible multi-storey car park. The location and the provisional construction drawing form a sharp contrast to the high density of the surrounding structures and can be considered a rarity within the Côte d’Azur, which is otherwise so densely populated. Nice Airport and the famous "Promenade des Anglais" are only 15 minutes away, serving a large number of inhabitants both from the coast of the Côte d'Azur and from the hinterland. Cagnes-sur-Mer urgently needs a new town hall and new, high-quality residential and commercial space in order to satisfy the demands of the continuously growing population. Amongst other things, it lacks a distinctive architectural "milestone" structure for offices in order to enhance its reputation and offer a location to well-known firms. The intention of the Casa Stega project on the one hand is to develop a partnership between Stega Construct SRL in Bucharest/Romania and Inpec Engineering Essen GmbH, while on the other hand acquiring private and institutional partners in order to construct a medium-sized high-rise office building known as "Casa Stega" at the location and expand the scope within the entire project of Cagnes. After a few meetings with the mayor of the commune Mr Louis Negre, Teodor Garabet, Chairman of both Stega and Inpec, presented an offer to construct a high-quality structure on the basis of his project, consisting of a medium-height (possibly high) office building in the best location, and therefore visible from afar. Previous reference projects of Mr Garabet in France, Los Angeles "The Jewelers Mall of Los Angeles" and Bucharest "Casa Stega" for buildings of the highest standards and quality were fundamental for the successful discussions and previously concluded agreements. In January 2009 Mr Garabet was received by Mr Alain Vernay, Deputy Director General, and his deputy, Ms Zorzan, in order to find the best location for the building project to pave the way for further considerations and the approval in principle of the Mayor. In February of the same year, Mr Vernay informed Mr Garabet that the Mayor had approved the basis of the offer for a high-rise building with offices at the planned location, which should comprise not fewer than 10 storeys. The course had therefore been set for further negotiations on construction planning. Owing to the generously-sized spaces between the developed areas, the location offers a good view of the structure from the adjacent motorway, which is 6 m higher than the base area of the building. The intention is for Casa Stega to represent part of the overall complex, and it can therefore be assumed that no further office buildings will be erected, although the construction of additional residential buildings, communal areas, parking spaces, buildings for recreational activities and the town hall will be carried out. 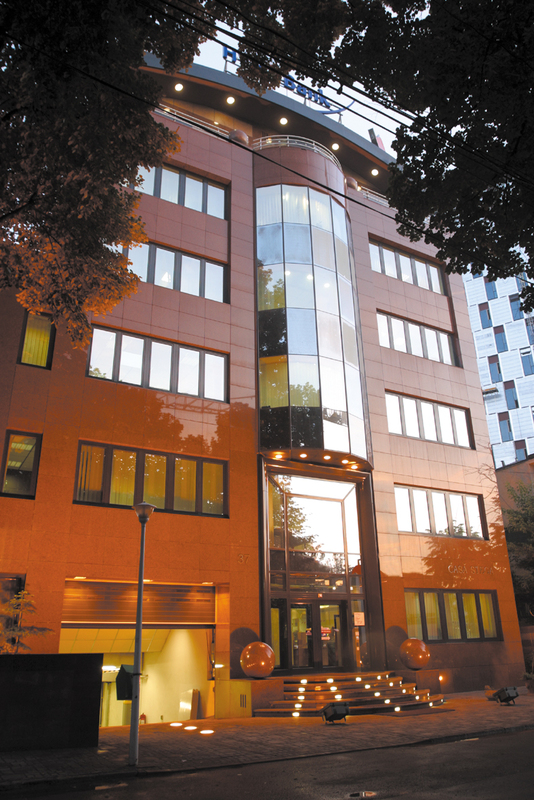 Casa Stega therefore enjoys the advantage of being the only office building within a universal project. For the overall project of the commune, a good deal of time has been scheduled for planning and approval by the Communite Urbaine Nice Côte d'Azur. In January 2012 administration of the project was transferred to a new managerial body known as "La Metropole Nice Côte d'Azur", which comprises 45 municipalities. La Metropole represents a new Établissement Public de Coopération Intercommunale ("Public Establishment of Intercommunal Cooperation") which pursues the aim of implementing major projects in favour of the development of the economy, environment and education. The project therefore fell under the responsibility of a part of La Metropole that belonged to the civil service which bears the name "DGA Urbanisme, Logements et Transports of the Metropole Nice Côte d'Azur". Mme Laurence Jacquiers, Director of Operational Planning, is responsible for the project and is working on its implementation for the Direction de la Strategie Urbaine et de l'Amenagement. In August 2012 Mme Laurence Jacquiers again confirmed Teodor Garabet as a potential investor for the future execution of his proposed project CASA STEGA. La Metropole Nice Côte d'Azur is now undertaking intensive local research in order to compile a picture of public opinion as well as community requests and decisions for the planned initial groundbreaking ceremony in 2014.